2 posts in one day? I must really like you guys. In all seriousness, I couldn’t possibly let my 279-week streak of obsessions die, despite this morning’s reflections and revelations. Something I think we all could use right now, is a mental break. So, please enjoy these funny dog videos at your leisure. I’ll be back at it next week with our regularly scheduled programming. I’m out of my mind today after a 6am flight to Phoenix and connection to San Antonio. It’s my first time in the Lone Star State for more than a layover in Dallas-Fort Worth, and I’m beyond pumped to hang with two good friends from high school. We’re here for two days before road tripping to Austin — hang onto your hats. “Three’s Company” Live! : Since it’s now a tradition, a friend and I saw the latest drag show installment from the fine folks at Oasis. The characters were over the top, and the jokes were nonstop. I can’t wait for the next series these divas bring to life. Father John Misty: I was skeptical of this indie rocker when he came to town last year, following the release of his second solo album. But the BF got us tickets and I was swiftly proven wrong. His sound is soothing, yet can shake you to the core. I do love you, Honeybear. 8th Grade Girl Shuts Down BMI: I’m in the business of health now, but BMI continues to be a controversial topic. While I do believe it serves a purpose, I have to applaud 8th grader Tessa Embry, who wrote a scathing takedown of the concept for a health class exam. Adolescent bodies are judged plenty without this metric to worry about — well done, Tessa. Mutual Rescue: This series from the Humane Society of Silicon Valley is guaranteed to make you smile. And ugly cry, but smiles too. The latest introduces us to Eric, who was suffering from Type 2 diabetes and severely overweight. His and Peety’s story will hit you right in the heartstrings. This week’s finds have a bit of a recurring theme, but don’t get your hopes up for a new addition anytime soon. I simply find our four-legged friends to be a constant source of cuddly comfort and joy… that’s all. 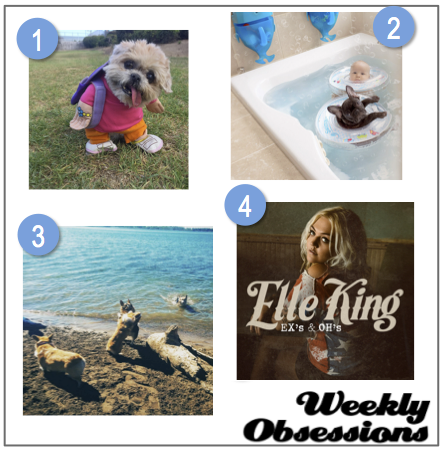 Marniethedog: This Instagram celebrity has 1.6 million followers, so you know she’s doing something right. That dumpy tongue and the cutest little getups are just a few reasons why you’ll love her, too. Dilan & Farley: Photographer Ivette Ivens’s son and French bulldog were born on the same day and have been raised like siblings together in their Chicago home. Her photo series will melt your heart and make you smile (some images NSFW). Corgi Beach Party: Ain’t no party like a corgi beach party, ‘cuz a corgi beach party don’t stop. Orrrr something like that… But seriously, how can you not squee over the infinite cuteness? I may or may not need a hobby. “Ex’s and Oh’s” – Elle King: I’m sure you’ve all fallen for this gritty, soulful song by now — but just in case you haven’t, here’s my official endorsement of the platinum-haired powerhouse and her first megahit. Just try and listen without jamming along.